Bristol Spaceworks (BSW) booked a table at the inaugural Empire Fighting Chance (EFC) Charity Quiz in Bristol City Centre on 31st May. BSW has been donating to EFC for several years and took a team of 8 people including employees, Directors, customers and friends to do battle with 17 other teams on the night. One of the introductory speeches was delivered by Martin Bisp, Co-Founder of EFC. The initial idea to help children lead a more positive life and reduce anti-social behaviour in the area came from a chance intervention Martin and (Co-Founder) Jamie Sanigar had with some teenagers near their gym in St Paul’s in 2006. From this initial foray into community work, it led to a massive demand from local children and schools to help mentor and guide local children with personal development issues. 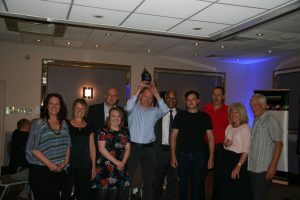 The quiz was hosted by former Light Heavyweight World Champion, John Conteh, who was eager to talk about the positive effects boxing and physical exercise, in general, has in communities. Former EFC Trustee and Bristol Mayor, Marvin Rees, was also present on the night to lend his support. 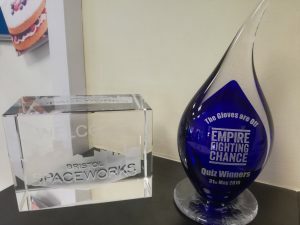 The Spaceworks Team (aka ‘Space Cadets’ on the night) had a good mix of ages and experience, aiming to cover as many of the topics as possible. This was particularly in evidence from BSW Director, Jen Gill, who demonstrated an eclectic knowledge of 17th Century Politics and Scooby Doo characters. After 8 brain-teasing rounds of trivia the Space Cadets were announced as the winners. The Bristol Blue Glass trophy was presented by John Conteh to 8 jubilant Space Cadets.